This charming west coast town focuses around an attractive little harbour, whose picturesque open-air fish restaurants line a quayside of bright fishing boats. Pafos has an air of holiday charm combined with history and olden-day elegance is lent to the town, which leads to the shopping area. 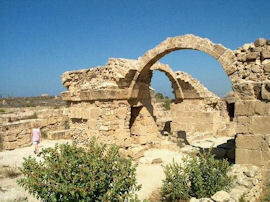 The lower part of the town, known as Kato Pafos, (literally "lower" Pafos), has a life of its own. Down near the sea, home of the harbour, the fish taverns, souvenir shops and several modern hotels with important archaeological sites around them. Pafos is known as the "Playground of Aphrodite" and the "Aphrodite's Rock", birthplace of the goddess, jut dramatically out of the sea some 16 miles east of the town. Legend says that if one swims around the rock three times, at midnight, with a fool moon, you will be young and eternally beautiful! To the north of Pafos, one can find the Baths of Aphrodite, where our local heroine used to bathe herself.The whole area is rich in historical and archaeological treasures. 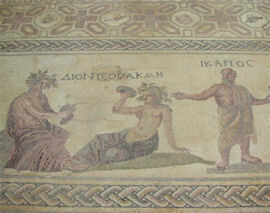 The most fascinating are the famous mosaics found in the house of Dionysus, beautifully preserved after 16 centuries under the soil. Another important site is that of the Tombs of the Kings. A large real-style burial ground of catacombs and mysterious vaults dating back to the third century BC. Further points of interest in Pafos are St. Paul's Pillar to which, according to tradition, the saint was tied and whipped for preaching the Christian religion, and the fortress castle in the harbour. This dates back to 13th century AD and was destroyed by the Ottoman Turks in 1570. It has been rebuilt, knocked down and then rearranged to form a Roman Fort, a castle, a Turkish tower and even a British warehouse for salt. For those wishing to explore a little further a field, the surrounding area boasts many charming villages each with their own individual character and also the idyllic Coral Bay whose golden sandy beach and sheltered bay is a sun-worshippers paradise. Throughout the many thousands of years each different race and civilization has left its mark on Paphos and there remains many places of interest for each visitor to see. 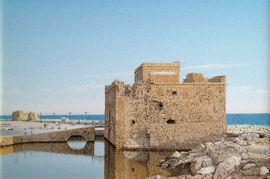 All of this makes for a great reason to visit Cyprus in one of our Luxury Villas in Cyprus.